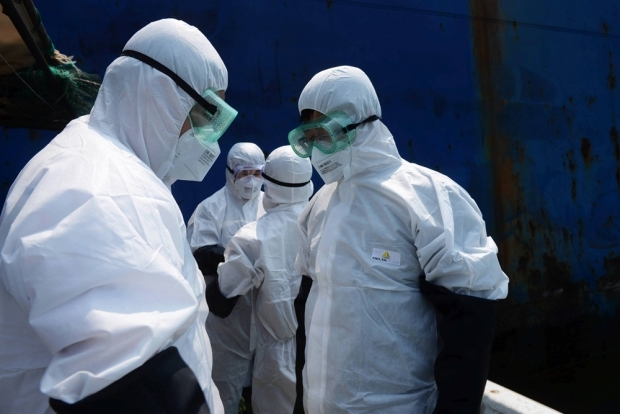 Quarantine officers inspect the Alpha Friendship, a bulk carrier registered in Greece that transports ore from the Pepel port in Sierra Leone, one of the Ebola-hit areas in Western Africa, as it awaits entry at Qingdao, Shandong province. When the ebola crisis first struck West Africa, China was among the only major powers to not only keep its personnel in the affected countries but to also send tens of millions of dollars in badly needed aid. The U.S., by contrast, was visibly absent. That is, until President Barack Obama announced the deployment of 3,000 U.S. military personnel on top of $175 million in other assistance. Now, critics are accusing China of not doing enough given its outsized economic presence in West Africa. Sure, China is now Africa’s largest trading partner but given its own status as a developing country, is it fair to compare the U.S. and Chinese responses to the ebola crisis?